The World Children’s Baseball Fair (WCBF) held the 20th Anniversary Award Luncheon at the Riviera Country Club in Pacific Palisades, California last weekend. Founders Sadaharu Oh and Hank Aaron were honored among others. 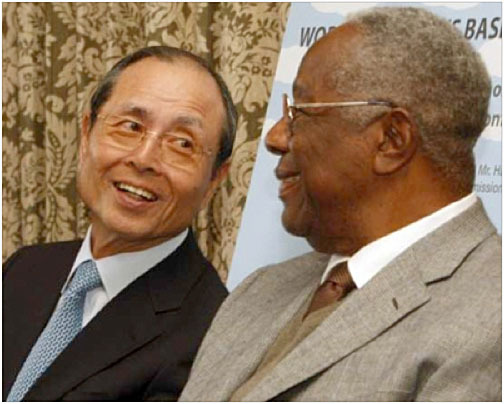 Recognizing that the sport of baseball promotes teamwork, good health, discipline and friendship, Sadaharu Oh and Hank Aaron, along with Dr. Akiko Agishi, Founding Director, conceived the idea of the WCBF as a means of creating international goodwill and fellowship among the children of the world. Being friends since a homerun derby in front of 40,000 people at Korakuen Stadium in Tokyo, Japan, Sadaharu Oh and Hank Aaron co-founded the WCBF in 1990. They hit a combined 1,623 homeruns between the two. Baseball’s royalty was well represented on Saturday to celebrate the pair of homerun kings, including MLB Commissioner Bud Selig, who just extended his contract by two more years, and Hall of Famers Lou Brock and Frank Robinson. The International Baseball Federation (IBAF) was represented by Paul Seiler (USA), who awarded Tom Valcke from Canada with a special recognition award. The World Children’s Baseball Fair is held annually at different sites in the world. Overall more than 4,730 boys and girls from 85 different countries have participated. The 22nd edition will take place from July 22 to 30, 2012 in Wakayama, Nara and Mie in Japan. The International Baseball Federation (IBAF) has been supporting the WCBF since the start, dispatching coaches and coordinating the clinics during the events. IBAF honored Sadaharu Oh and Hank Aaron with plagues recognizing their longtime contribution to develop baseball worldwide.